When you stay at Pinnacle in North Myrtle Beach, South Carolina you will find yourself spoiled by special North Myrtle Beach condo rentals that feature private balconies with ocean views. Pinnacle is a North Myrtle Beach resort with North Myrtle Beach condo rentals that provide you and your family spacious accommodations. Located directly on the Atlantic Ocean in North Myrtle Beach, South Carolina, these North Myrtle Beach vacation rentals make for a wonderful vacation setting for larger families. Pinnacle is at 2507 South Ocean Boulevard in North Myrtle Beach, South Carolina. These North Myrtle Beach condo rentals are in the beautiful Crescent Beach section of North Myrtle Beach, an area popular with families. This North Myrtle Beach condo rental building is on the oceanfront so the Atlantic Ocean is your backyard and the white sandy beaches are your playground. 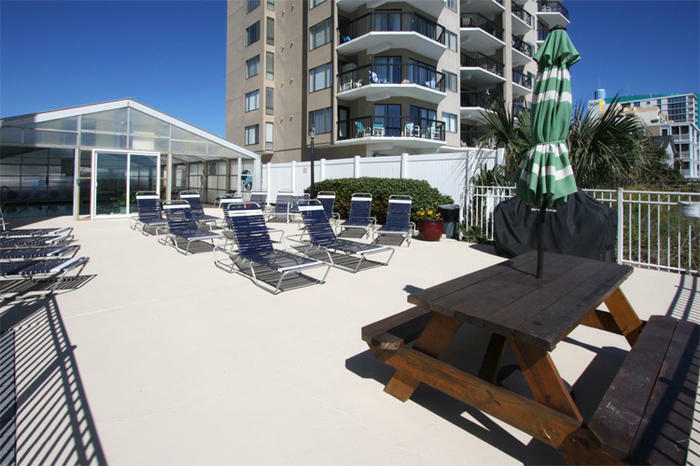 At Pinnacle in North Myrtle Beach in South Carolina you will find yourself and your family and friends lounging oceanfront and relaxing everyday of your North Myrtle Beach vacation. At the back of the North Myrtle Beach condo rental building there is an oceanfront lawn. On the other side of the lawn there is a small sandy path that will lead you right to your only little piece of paradise–the North Myrtle Beach white sandy beach and Atlantic Ocean. Follow the pathway to the beach and indulge in long walks, beautiful views and opportunities to jump the ocean’s waves. Only a few feet from your North Myrtle Beach condo rental at Pinnacle you will be able to build sandcastles and search for seashells for hours. The Pinnacle condo rental building is a 9-story building with covered parking. There are two elevators and two sets of stairs to get you quickly up to your North Myrtle Beach condominium. One the other side of the oceanfront lawn you will find a sandy path that leads to the Atlantic Ocean. Just a short walk from your North Myrtle Beach condo rental you can spend hours walking up and down the beach or just enjoying the South Carolina sunshine. Build a sandcastle for a king and lay out on a beach towel for an afternoon nap during your North Myrtle Beach vacation. Elliott Beach Rentals is not affiliated with onsite management or the HOA of Pinnacle.